On the Threshold of Discovery! The ancient lands of Osirion are blanketed by the sands of time, and eldritch secrets and vast riches lie just beneath the sun-blistered surface. As modern Osirion opens its tombs to outsiders for the first time in centuries, many of these lost treasures and secrets are now emerging—some more malign than others. Can your group of heroes brave terrible guardians, foul cults, and the burning sands of the desert to stop the rebirth of an ancient tyrant? This complete cooperative strategy game pits 1 to 4 heroes against the monsters, curses, and traps of the Mummy's Mask Adventure Path. Choose your character's class; build a deck of equipment, magic, and allies; and explore dangerous locations as you journey through an exciting fantasy tale. As your adventures continue, your characters add unique gear and awesome magic to their decks as they gain incredible powers, all of which they'll need to challenge more and more powerful threats. More than 500 cards, featuring 7 character classes, a wide array of gear and magical treasures, and dozens of allies, monsters, and villains from the Mummy's Mask storyline. The Half-Dead City Adventure Deck, which begins your journey through the Mummy's Mask Adventure Path. 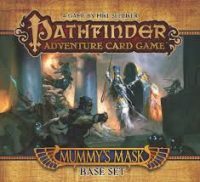 Add a Review for "Pathfinder Adventure Card Game: Mummy’s Mask – Base Set"